In a large saucepan, combine sugar and cornstarch. Stir in water until smooth. Add blueberries. Bring to a boil over medium heat; cook and stir for 2 minutes or until thickened. Remove from the heat; cover and keep warm. For pancakes, in a large bowl, combine the flour, sugar, baking powder and salt. Combine the eggs, milk, sour cream and butter. Pour batter by 1/4 cupful onto a greased hot griddle. Turn when bubbles form on top; cook until the second side is golden brown. Yield: about 20 pancakes (3-1/2 cups topping). 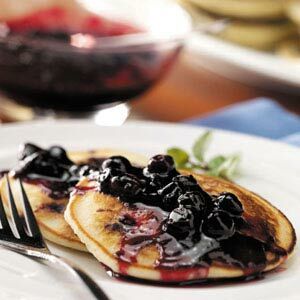 Nutrition Facts: 2 pancakes with 1/3 cup topping equals 332 calories, 13 g fat (8 g saturated fat), 79 mg cholesterol, 387 mg sodium, 48 g carbohydrate, 3 g fiber, 6 g protein.